For Nebraskans, Far and Near. What did you look for in a poem for the anthology? 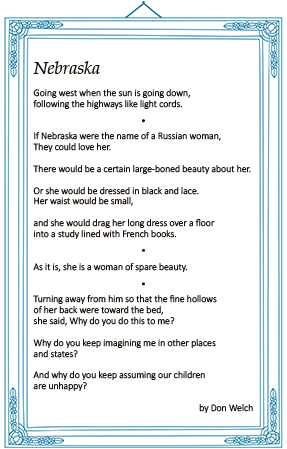 My personal criteria for any poem is that it does what Emily Dickinson says a poem should do -- that it takes the top of your head off. Naturally, this is a messy process, and I spent a lot of time in the ER having my head fixed, but we got a good anthology out of it, so it was worth it. Why do you think an anthology is a worthwile venture, given all the work it involves? 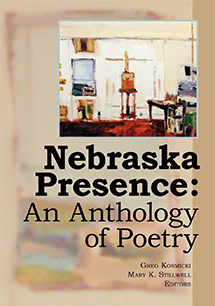 Walt Whitman said, "To have great poets there must be great audiences," and we are fortunate here in Nebraska that so many people read poetry, as well as to poetry readings. Each semester when I ask students to bring in their favorite poems, they bring in Mother Goose, Dr. Seuss, and Edward Lear, and they also bring in poems by William Blake, Emily Dickenson, Basho, Edgar Allen Poe (a big favorite), and a sampling of Nebraska poets. Their teachers and the poets who visit their classrooms in primary and secondary schools are doing a fine job introducing a variety of poets and poetic traditions. I think an anthology can and will stimulate the reading and writing of poetry even more.